Win Walking Out: A deadly adventure into the wilderness | SWITCH. Based on the 'American Short Story Masterpiece' by David Quammen, 'Walking Out' tracks fourteen-year-old David’s (Josh Wiggins) annual visit to rural Montana to see his brooding, off-the-grid father, Cal (Matt Bomer). Separated from the comforts of home, David is reluctant and resentful as Cal plans the boy’s first big game hunt. As the pair ascend into the wilderness, Cal tried to connect with David by recounting the story of his own first kill, on his last hunting trip with his now long-dead father (Bill Pullman). After their trip is disrupted by a chance encounter with a grizzly bear, a wounded Cal realises they must both rely on David’s strength and resilience to survive. 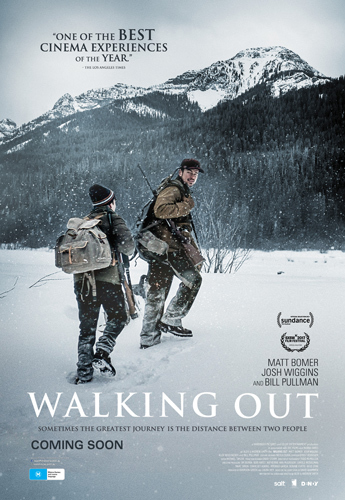 Click here to read our theatrical review of 'Walking Out'. The 'Walking Out' competition has now closed. Winners will be announced shortly. Competition opens at 5pm AEDT on Sunday 25th March 2018 and closes at 11:59pm AEST on Sunday 1st April 2018. Five winners will be chosen at random on Monday 2nd April 2018. To successfully win, entrants must fulfil the above entry conditions before the time the competition closes. Current members/followers are eligible to enter the competition. Only one entry per person. Only one winner per household. To be a valid winner, the entrant must not have won a prize from SWITCH within the last 28 days. Each winner will receive one double pass to 'Walking Out'. By entering, you agree to receive occasional emails from SWITCH in the future. If you decide to unsubscribe from these updates, any further entries will not be applicable. Only Australian residents are eligible to enter. 'Walking Out' is in cinemas from Thursday the 5th April 2018 through Icon.